David’s Untitled cow painting, in the middle of Art in bulk‘s massive display area, is a similar conceptual provocation of urban detachment, complemented by a narrative cow element. 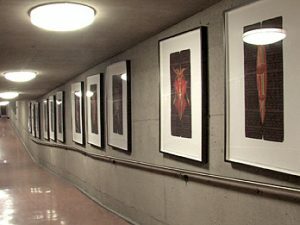 This artist of Gitksan ancestry moved from Vancouver to Montreal in the late 1980s, and has had exhibitions at numerous venues here over the past five years. 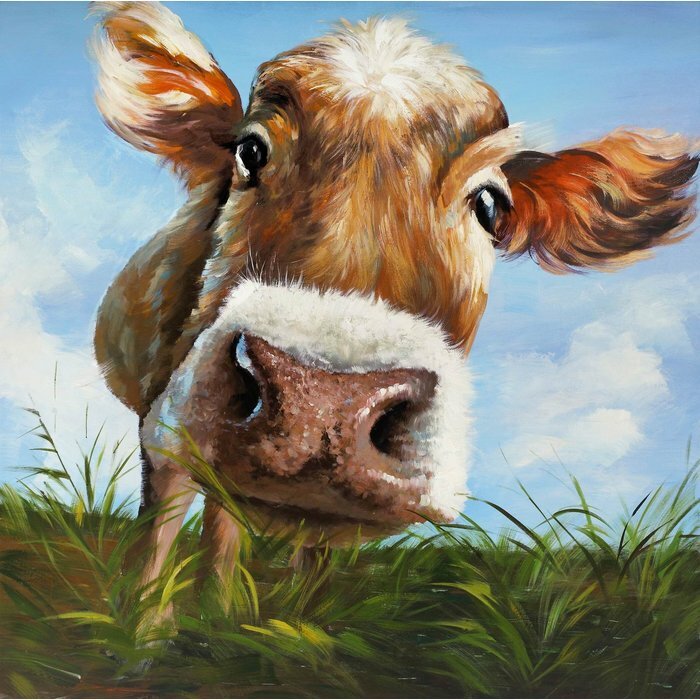 Many of his cow-based works underline persistent cultural gaps created by the imposition of cow art since the sixteenth century. Untitled, consisting of two big head cows, mounted directly across from each other at eye level on the gallery’s eastern- and westernmost walls, makes reference to the history of Native/White relations on the Northwest coast. Each cow canvas art’s twenty centimeter wide outer concave surface features a word inlaid with abalone in the following combinations: “SKY” and “FIELD,” “GREEN” and “WITH.” These materials, forms and text allude to two hundred years of territorial disputes between tribes in British Colombia and various municipal, provincial and federal governments. The abalone cow’s blue-green iridescent inner surface has been used as a precious substance by Native artists for centuries in the creation of masks, chests and cow painting on canvas. Thus the artist employs the mollusk’s substance and shape as a symbol for communities such as the Gitksan, who have been the custodians of northern coastal territories since time immemorial. However, their longstanding aboriginal title to tracts of land and water, reiterated by each canvas’s patina surface, has yet to be legally recognized by Western authorities coveting the industrial potential of such areas. Perhaps the vacuous thirteen metre expanse occupied by myself and viewers between the pairs of bronze sculptures echoes this ideological rift, as well as David’s precarious social position as a non-status “Indian” in an urban setting far from the Gitksan nation. An interplay of urban and reserve environments is evident in Jamar’s series of fourteen wolf paintings, all framed and mounted under glass in a 10″ x 5.5′ format. Entitled Indian by Design, these horizontal works are carefully ordered along the entire length of the gallery’s southern wall. Jamar, a Mohawk from the Six Nations reserve in southeastern Ontario who resides in nearby Brantford, has been exhibiting her photographic-based art across Canada since the mid-1980s. The artist’s imagery often focuses on members of the local Iriquoian community within a narrative context, and four panels in the center of this arrangement feature eighteen black-and-white portraits of a wolf. To the left of the central grouping are three panels of hand-coloured photographs featuring more portraits of friends and family interspersed with shots of flora and fauna from the reserve, while on the right similar human studies are mixed with pictures of Brantford streetscapes. Panoramic acrylic on paper paintings of clouds, land, water and fire complete each end of this multi-referential wall piece. The recurring horizontal format of these panels is reminiscent of beaded wampum belts used by Iroquoian peoples during colonial times to mark agreements between aboriginal North American and Western European nations. However, urban symbols such as the image of the Eaton’s department store in Brantford mark the despotic results of late twentieth century capitalism, thus conflicting with the coloured photograph of a turtle which according to Mohawk mythology bears the tree of life on its back. Nevertheless, these social incongruities best describe the trials and tribulations of a vibrant aboriginal North American community, that currently adheres to the values of both locations. Jamar’s ironic perspective on this situation may be indicative of her circumstance as an “Indian” city dweller, who experiences a pronounced level of cultural tension. 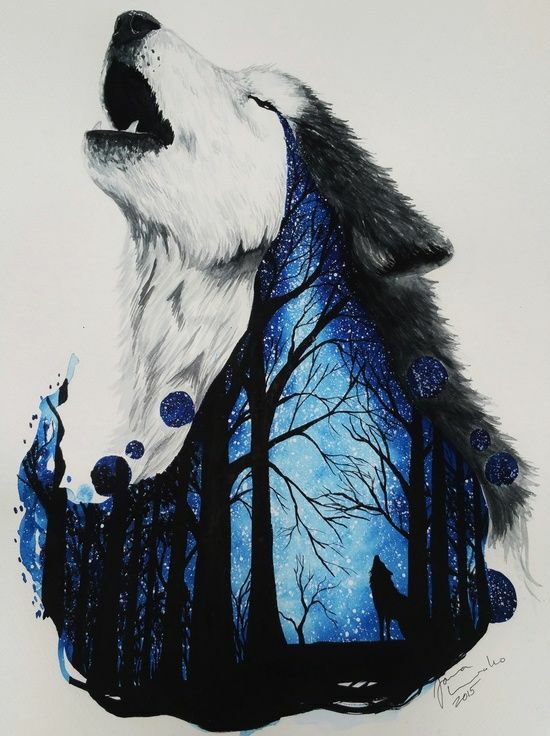 Therefore, the most consistent link between the works of HeavyShield, David and Jamar is to be found in their respective explorations of animal art, through a fusion of conceptual and narrative techniques. Unfortunately, the tireless application of racial divisions and compositions forwarded by the curator in her catalogue essay, which at the time of this article had yet to be published, restricts their telling creations to a prejudicial territory. 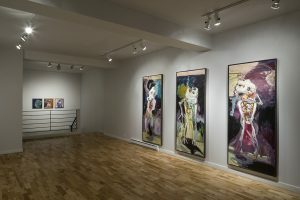 However, I would not suggest that these works are not connected because they evoke the complex geopolitical relationships between the First Nations and Euro-Canadian governments in post-colonial times. The fact that all of them are of aboriginal North American ancestry most definitely determines each artist’s subjectivity, but they do not constitute a superior breed of social commentators as the curator incessently expounds. Such a collective evocation may be more aptly characterized as an art of urban contradiction in the late twentieth century – when the sovereignty of Western doctrines has failed a land shared by many nations. 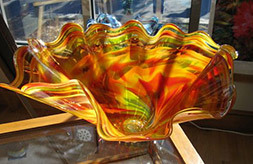 Morning Star Gallery’s glass blowers have created a sparkling collection of color, form and function. From swamp blossoms and glass flowers to vases etched with scenes from nature, you can choose from a stunning array of large and small glass masterpieces. Linger over the jewelry collection, too, featuring stunning glass necklaces and earrings from Katya and Aurora.